There's a little Lebanese restaurant near the office in Holborn that does a very smart trade serving lamb & chicken shawarma (sliced off a vertical spit), meshwi (cubed, grilled over coals) and kofte (minced and grilled) wraps to a lunchtime work crowd. The wraps themselves can be good, but they have an annoying habit of preparing a huge pile of the ones they think they'll sell in advance of the lunchtime rush, meaning that if you go in any time between 12:30 and 2pm they'll invariably reach for one off the cold pre-prepared pile, give it a quick blast in the sandwich press and then hand it to you. But, if you ask for a fresh one (yes, I am that person) they will (after a bit of huffing and puffing) usually shave you off some fresh shawarma and you can enjoy a half-decent kebab; not brilliant, but better than anything from Pret next door. But it got me thinking; what if someone did this kind of thing properly? Quality slow-cooked lamb shoulder, seasoned and spiced to perfection, home-made pickles, house chilli sauce, proper fluffy fresh bread, all made to order? If even a fairly thrown-together lamb kebab can satisfy (even when not eaten at 3am after chucking-out time), surely one made with skill and attention would be a revelation? And it is with this in mind, I'm sure, that Shawarma Bar was born. If anyone knows how to make a success of Middle Eastern comfort food it's the team behind Berber & Q, whose cavernous restaurant in Haggerston served me some of the most exciting dishes of 2015, and who, along with places like the Palomar, spearheaded London's newfound enthusiasm for this kind of cuisine. But it wasn't so much their ways with grilled meats as the exciting variety and quality of their vegetable offering that made more of an impact - their grilled cauliflower dressed in tahini and pomegranate seeds was an instant star dish, and house hummus showed you just how vital and vibrant this Levantine staple can be when made by someone who both knows and cares what they're doing. It's no surprise, then, that it's the side dishes, the details, that turn Shawarma Bar from being a very good kebab shop into something rather special. House pickles, for example, showed the full range from soft and sweet (carrots) to sharp and sour (onions), with soft gherkins, black olives and crunchy cabbage providing support. There was even a slice of shocking dyed purple turnip, something I really miss when it's not there despite it not being the most natural looking thing on earth. Mesabaha was - and there's no other word for it - wonderful, a perfect marriage of silky smooth tahini and juicy chickpeas, studded with some kind of chilli chutney which added both heat (though not too much) and a supremely addictive citrussy tang. The chollah it came with was soft and gently toasted over coals, and though perhaps not quite as brilliant as the Palomar's version (not quite as sweet or fluffy) it did a great job at scooping up the chickpeas. 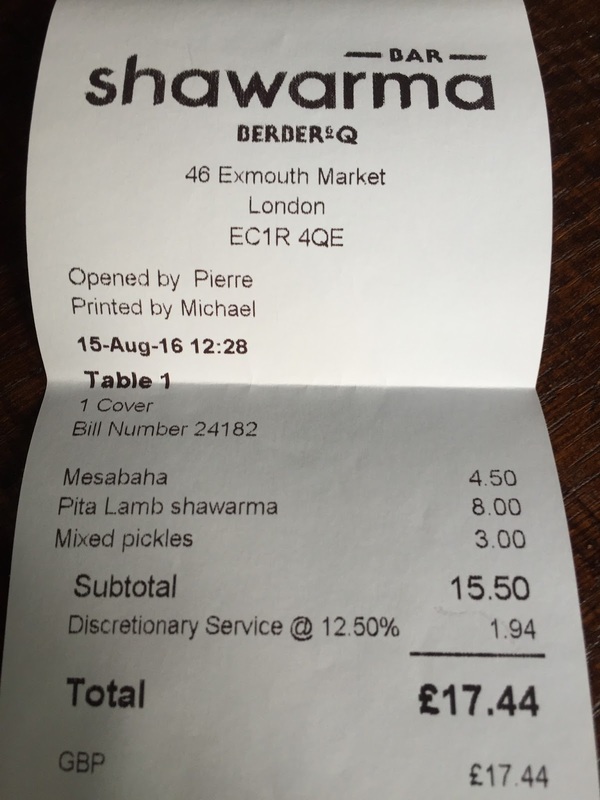 Nobody should go to Shawarma Bar and not order the Mesabaha. This bowl of Mejaderah contained fragrant spicy rice, crisply dry-fried onions and lentils, and was a comforting and interesting side dish showcasing - again - Shawarma Bar's mastery of texture and seasoning. Maybe if you're very well travelled or an aficionado of Levantine cooking in London you may have come across something like this before, but for many people (myself included) dishes like these are still a delightful novelty. And hugely enjoyable to eat, too, of course. And so to the main event, the lamb shawarma. Firstly, and most importantly, the meat is lovely, bags of lamby flavour and with all the variation in texture (soft fatty bits, crispy dark bits, smooth meaty bits) that you'd pick for your own kebab if you were there at the spit shaving the meat off yourself. The salad is fresh and crisp, the harissa sauce not too punchy but lending a nice gentle burn, and a generous handful of herbs, crunchy and bright as if they'd been pulled straight out of the ground, added more colour, literally and figuratively. And finally, binding it all together, a good dollop of that beautiful nutty, earthy tahini. The only thing that wasn't perfect about the shawarma - and I'm sure they have their reasons - was the bread, which was a bit too thick and doughy and meant that every bite was a bit heavy on the bread element. The pitas are flown in from Israel, I was told, and while doing their job well enough I can't help wonder how much nicer they would have been fresh out of the oven, or even cooked that morning somewhere in town. Perhaps that's the plan eventually, but meantime that's the only thing I'd change about what is otherwise pretty close to the best kebab in London. 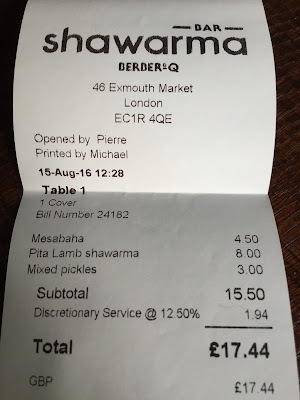 I'll be going back to Shawarma Bar - of course I will, I work 15 minutes away and it's brilliant - but I feel confident enough to post this review after only two and a half dishes because of their pedigree and because sometimes, the quality of a place is evident just on the first bite. Shawarma Bar takes all the things that made the Haggerston spot great - the skill with grilled meats, the radiant salads, the exotic Middle Eastern herbs and spices - and repackages it for an informal short-stop takeaway crowd in a lovely little room with no communal seating or annoying loud music. It is, essentially, Berber & Q - The Selected Highlights. The Greatest Hits. And I'm predicting massive chart success. There's every chance Shawarma Bar will be in the next version of the app. Meanwhile, see what I had to say about what else is in the area. ITS NEXT DOOR TO MY NEW OFFICE!!!!! What is the place in Holborn, for future reference? G Tilley: Hiba Express, next to McDonald's.